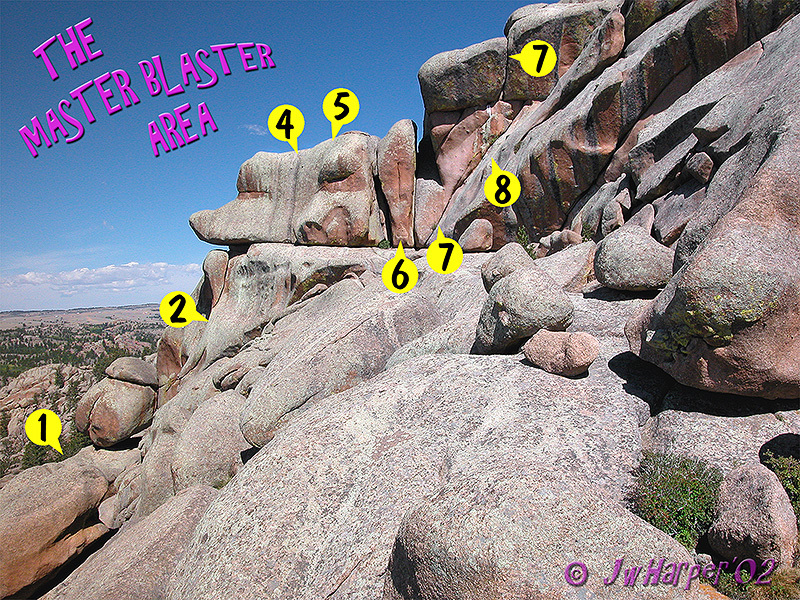 MASTER BLASTER is a fairly hidden area, but most sought after for its namesake climb ‘MASTER BLASTER’, a severely overhanging ‘test piece’ hand and fist crack about 5.10c. It is strenuous at the grade and has ‘blasted’ more than a few climbers who claim to be ‘5.10 leaders’. There are 2 ways to get here. First is to get to the top of the Central Massif in any way you can, for example up Edward’s Crack or hike up from the Box Canyon. Find a very old pine tree with a huge trunk and not very tall near the SW top. Go under some boulders and follow a descending ramp. Second, one can also approach from the Turtle Rock Trail. After breaking out of the first aspen grove (approx. 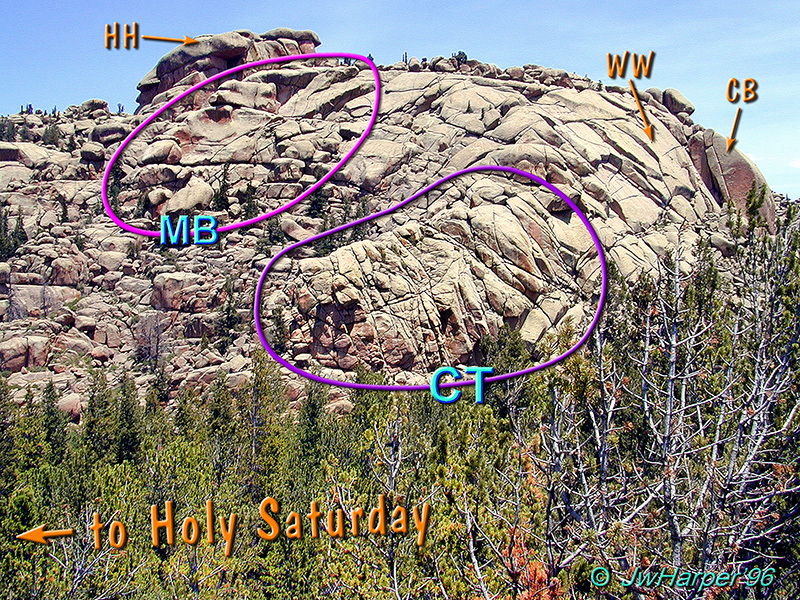 250 yards from the gate, just past Chinatown) when heading for Holy Saturday, begin scrambling up through the boulders. 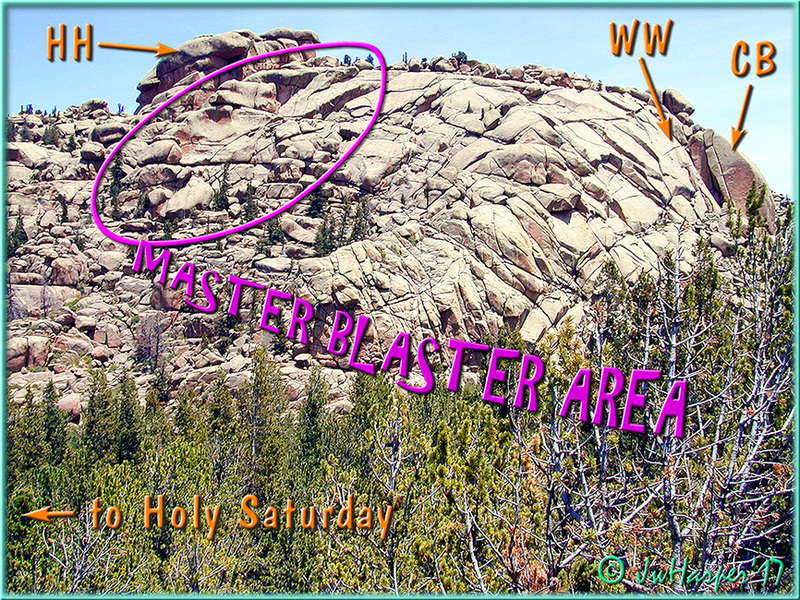 You can see ‘Blaster Junior’ and the large dog faced boulder perched atop ‘D*rty Pictures From The Prom’ from here. Hassler’s Hatbox, Master blaster and Chinatown. Each is a separate, well defined area. They do NOT run together. * Note: You can see Hassler’s Hatbox above and behind MB. 1.) Blaster Junior 10a Begins up a semi-detached flake and transitions into a quality vertical hand crack with an exposed move. Belay on gear underneath the huge boulder. (Harper and Jurkowitsch,’94) NOTE: Can be linked with #2 to access the main part of the area. 3.) Trip Master Monkey 12b Get ready for inversion therapy at its upper limits!! 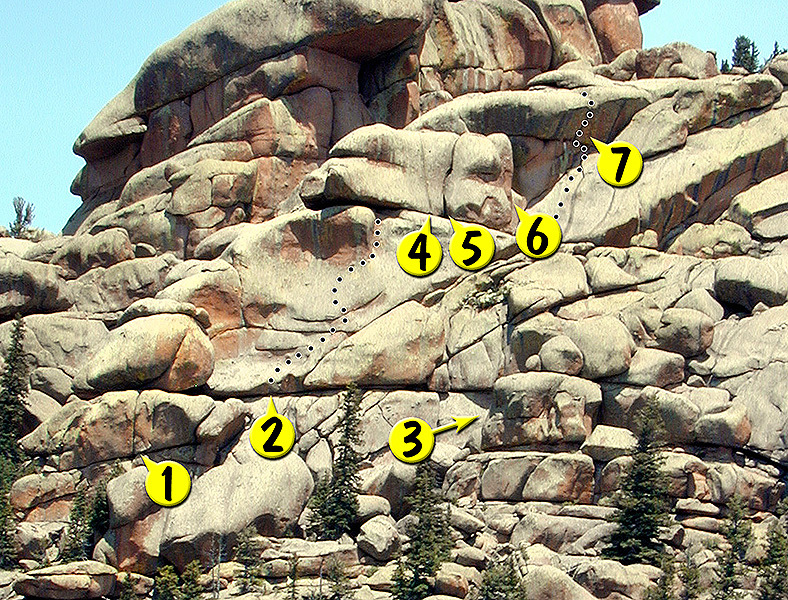 This famous OFFWIDTH will test your skills. Go up the gully full of dropoffs, assorted boulders and caves ….. about 20 yards past the arrow. 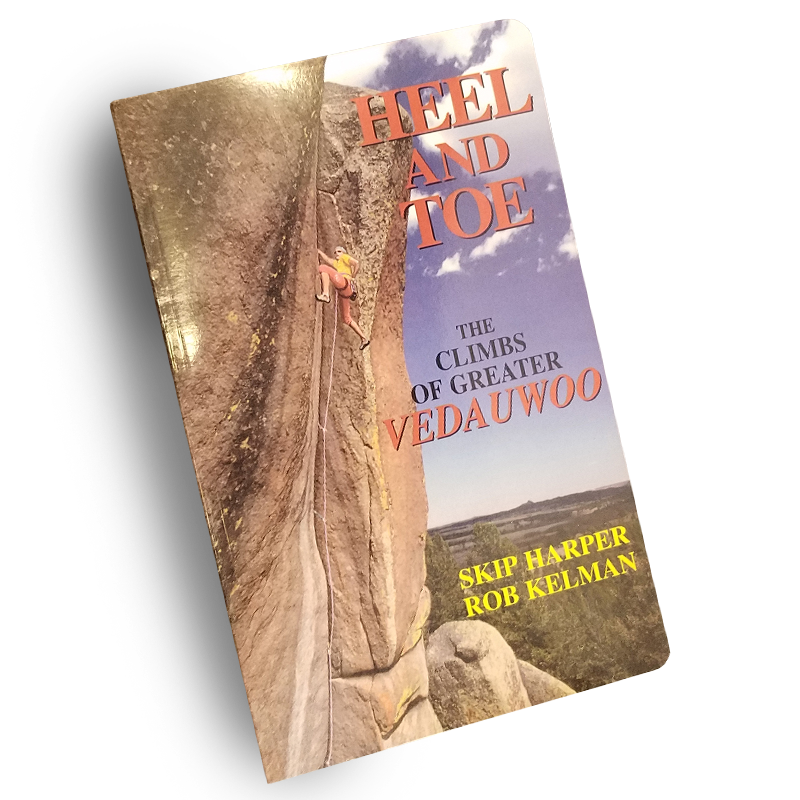 (Scarpelli and Rangitsch, c’89) A photo of this route appears on the Climbing at Vedauwoo page. 5.) Left Femur 6 Wide and ugly chimney and off-width with a contortional ending. 8.) Drip Drop 9+ The original, alternate, 2 bolt, nearly featureless face route leading up to the Master Blaster crack. (Agee and Cupps, c’88). * NOTE: This route has been extended past its original end point to a two bolt anchor at its top and renamed Zoot Chute in the Orenczak ’11 guidebook. One informative view of MB. See another below. Another View of MB. Notice Hassler’s Hatbox above and behind. Yep, click on this one too.